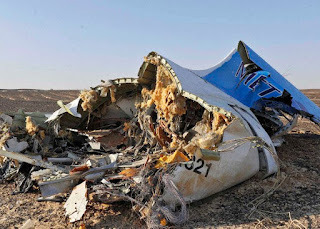 A Russian Metrojet A-321 with 224 passengers and crew crashed in the Sinai Peninsula Saturday after being lost on radar. The aircraft was enroute to St. Petersburg from Sharm El Sheikh and was climbing through about 31,000 ft when radar contact was lost. There were no survivors found. The flight data and cockpit voice recorders have been found in good condition. There were preliminary reports of the pilots having made distress calls but those were later rescinded. The wreckage was found in two major pieces spread over an area of about 8 km. Such a dispersal of debris suggests that the aircraft may have suffered an inflight breakup. This has led to speculation concerning either a terrorist missile, MANPAD or structural failure. A terrorist group claimed credit for downing the aircraft but these reports have been dismissed as not being credible as has a video that the group released. Intelligence reports claim that the terrorist organizations known to be operating in the area did not have missiles capable of reaching the altitude at which the aircraft was flying. A notice to airmen (NOTAM) had been released advising aircraft in that area to not operate below 26,000 feet due to terrorist activity. Likewise, analysis of the wreckage will confirm whether or not a bomb had been placed on board. The aircraft itself, an Airbus A-321, was one of the oldest of the type in operation having been delivered in 1997. While the age of the aircraft should not be a factor in the crash, the aircraft had suffered a tailstrike in 2001 which resulted in significant damage while it was owned by Lebanon's Middle East Airlines. The aircraft was repaired and returned to service. There have been several instances of airliners suffering structural failure which was due in part to repairs done after tail strikes. The most notable of these was Japan Airlines 123, a Boeing 747, which crashed in 1985 after a faulty tail strike repair failed resulting in a rupture of the pressure bulkhead. Speculation and conspiracy theories are as usual expected to run rampant. Cutting the wheat from the chaff when an airplane goes down amid geopolitical unrest is always a challenge. Hopefully the truth behind this tragedy emerges unscathed. UPDATE: The crash area is now being reported as 350 x 500 meters, smaller than initially reported. UPDATE 2: Analysis of the cockpit data recorder now suggests that the crew had no warning before a catastrophic event brought down the aircraft. Further analysis of the wreckage should be able to discern the nature of the failure and whether it was a bomb or structural failure possibly due to an old tailstrike repair or undiscovered corrosion. UPDATE 3: While no evidence of a bomb on board the downed Metrojet airliner has yet been publicly produced, David Cameron, PM of the U.K. has gone on record stating that a bomb was the likely cause of the crash. US officials have also said that they suspect a bomb was the cause. The U.K and now the Netherlands have suspended flights to the Sinai Peninsula in the wake of the announcement. Will There Be an Airline Strike?